The U.S. Department of Education announced late Tuesday that it was reversing course on its plan to award all federal student loans to a single student loan servicer and creating a new “environment” for how it operates — a move that student advocates and even one of the most vocal critics in Congress tepidly hailed as a good move. “I’m glad the Education Department is changing course, but it will be important to continue watching the Department to evaluate whether its decisions are good for the millions of struggling federal student loan borrowers,” said U.S. Sen. Elizabeth Warren, (D-Mass. ), who has accused U.S. Secretary of Education Betsy DeVos of putting the interests of business ahead of the interests of students. Warren made her remarks in a statement after DeVos announced that the Education Department was cancelling its student loan solicitation. FSA is charged with overseeing federal student aid to some 42 million loan borrowers. “The FSA Student Loan Program represents the equivalent of being the largest special purpose consumer bank in the world,” Dr. A. Wayne Johnson, the newly appointed Chief Operating Officer at FSA, said in a statement. “To improve customer service, we will take the best ideas and capabilities available and put them to work for Americans with student loans,” Johnson’s statement said. “When FSA customers transition to the new processing and servicing environment in 2019, they will find a customer support system that is as capable as any in the private sector. Details of the new “environment” were sketchy and non-committal in terms of how many contract servicers would be involved. “After just a few weeks on the job, Wayne has already identified potential ways to modernize FSA and to leverage new technology that will not only enhance the customer service experience for borrowers but will also protect taxpayers,” DeVos said in her statement. Contracts with current FSA student loan servicers expire in 2019, according to the Education Department statement. The new processing and servicing “environment” is expected to be in place before those contracts expire. 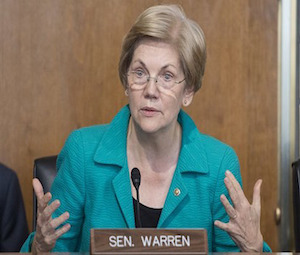 Warren noted that Education Department’s cancellation of its plan to award federal student loans to a single servicers came just one day after she and other lawmakers introduced the bipartisan “Student Loan Servicer Performance Accountability Act,” which she said would have forced the Department to cancel their single servicer plan. “Congress should pass our bipartisan legislation to ensure that the Department never heads in this direction again,” Senator Warren said.